A C band MCM (multichip module) type low noise amplifier (LNA) with GaAs HEMT and MMIC has been designed. The MMIC is brought from OMMIC and used as a gain block. 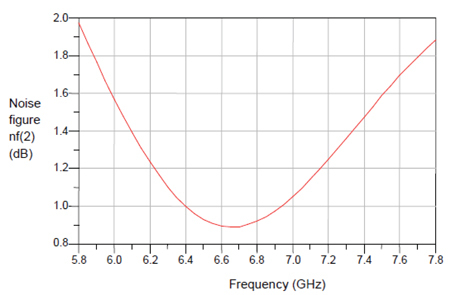 The LNA has around 3 dB gain variation covering from 5.8-7.1 GHz with gain of more than 32 dB in the entire bandwidth and noise figure minimum of 1.8 dB and maximum of 2.4 dB in the whole 5.8-7.1 GHz range. 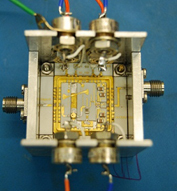 The goal of the circuit is such that the LNA can be used in wide range of frequencies as a module for future space missions. The low noise amplifier (LNA) is an essential part of the front end of any receiver as it determines the overall noise figure of the system and the minimum detectable signal. MMIC based amplifiers are available abundantly with very high gain and small size. On the other hand the discrete LNAs are bigger in size but noise performance is better with less DC power consumption. This paper gives a design demonstration on C band LNA of MCM type, taking into account of the advantage that MMICs are broad band, small size, and high gain amplifiers and discrete LNAs has predominating low noise figure for a whole chain of amplifiers with reasonable increase in DC power consumption. The MCMs are placed in a Kyocera package of dimension 16.2 mm × 16.2 mm for repeatable performance and easier handling. The discrete LNA is HEMT based (CFY-67) of Infineon and the MMIC is brought from OMMIC (CGY2178UH). 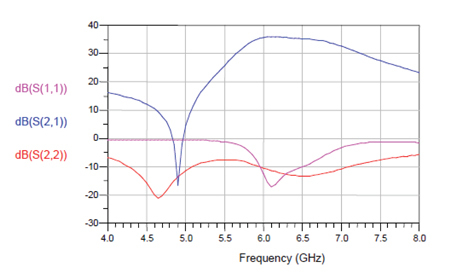 The total circuit has a 3 dB gain variation in 5.8-7.1 GHz. The noise figure has 0.5 dB (typical) variation throughout its operating range. The circuit simulation and analysis tool used is ADS 2003. The typical design approach that was adopted for the circuit is summarized below. In the MCM the GaAs based HEMT is suitable for low noise applications owing to device properties like electron mobility and transconductance. Unlike GaAs FETs where mobility is restricted owing to 3D scatter in the channel, HEMT have higher mobility due to 2D effect. This feature is due to the doping structure where the ionized atoms and donors are separated by a spacer layer of AlGaAs. The electrons are transferred from the wide band gap doped AlGaAs to low band gap un-doped GaAs and are confined in a triangular shaped quantum well. The electrons and ionized donor atoms are thus separated from each other. This reduces the inbuilt noise of the device due to scattering and can be used for low noise application. Also the channel mobility does not freeze at low temperature and can be used for space and deep space network. The simulated DC characteristic of the HEMT is shown in Figure 1. For low noise, low power application the quiescent point ‘A’ (Figure 1) is used as it operates at a low value of current (10-15% of IDSS). Figure 1 • DC characteristic curves (Id vs. Vds). To design a broad band LNA the most suitable option is to use a MMIC as the 2nd stage. Here the MMIC is used as a broadband gain block. The typical gain of the MMIC above 6 GHz is 23 dB. 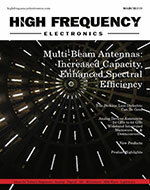 Our aim is to match it for typical gain of more than 30 dB for the full operating bandwidth from 5.8-7.1 GHz. The MCM is assembled in a Kyocera package which has a frequency response curve suitable for C band applications. The circuit is fabricated on 10 mil alumina substrate. Alumina is preferred for low loss tangent 0.0001 and less variation in the effective dielectric constant over wide range of temperature specially needed in space application. Also the substrate is suited for thin film technology that provides repeatability. Using the linear S parameter file the source and load stability circles are plotted. The device was made stable by placing the stabilization resistor of 33 ohm in parallel at the output of the device. The value of the resistor is determined taking into account of the device lead mounting area. 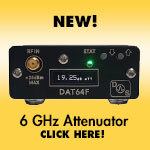 This gives stabilization below 5 GHz covering the operating region and up to higher frequency. The stability factor of the LNA before and after stabilization is shown in Figure 2-3. Figure 2 • Stability factor vs. Frequency curve before stability. Figure 3 • Stability factor vs. Frequency curve after stability. The Sopt (corresponds to minimum noise figure of the device) curve and the conjugate of S11 (corresponds to return loss of the device) curve (5.8- 7.1 GHz) which were little apart in the Smith chart are brought closer to the center of the Smith chart by appropriate matching transmission lines for the whole frequency range. This ensures a gain and simultaneous low noise matching in the desired frequency range. Source inductance which is introduced due to the assembly gap between HEMT device and substrate helps to bring the conjugate of S11 nearer to gamma optimum (Sopt) . 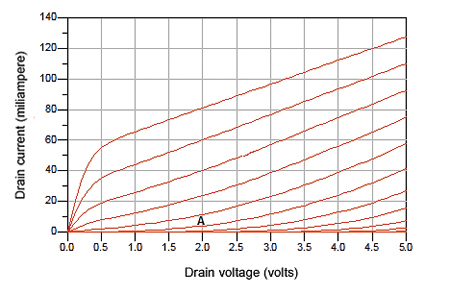 The input, output and source inductance values (generated due to flip mounting of the device) are calculated from the available gap and are taken into account in simulation. The circuit was optimized taking the matching elements (input, output series and shunt elements) as variables. Figure 4 • Simulated Noise figure vs. Frequency response curve. The input of the MMIC and the output of the first stage discrete LNA is matched for maximum power transfer at the operating frequency range of operation (5.8-7.1 GHz). The output return loss is determined mainly by the MMIC. As a result in simulation the 1.5 dB bandwidth achieved is 1.4 GHz with a maximum gain of around 35 dB at 6.25 GHz. 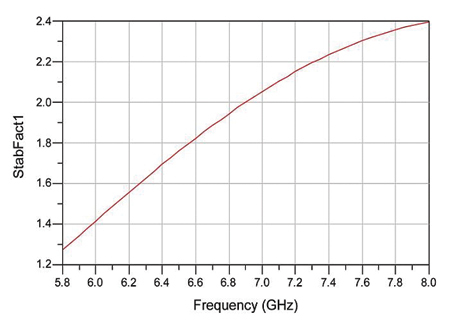 The noise figure varies from 2.2 dB maximum to minimum 0.9 dB in the operating frequency range. 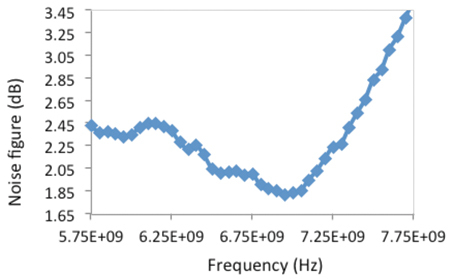 The simulated noise figure and gain response are shown in Figure 4 and Figure 5, respectively. Figure 5 • Simulated Gain vs. Frequency response curve. The circuit is fabricated using MIC thin film technology on 10 mil alumina substrate and placed into a 16.2 mm×16.2 mm package of Kyocera. Extension lines made on 25 mil alumina substrate are provided for testing the packaged circuit. Ribbons are used for connecting the circuit with the Kyocera package and from package to external circuit on 4 areas (2 inputs and 2 outputs). The measured results of gain and noise figure are shown in Figure 6 and Figure 7. From the measured result it can be seen that the 3 dB bandwidth achieved is 1.3 GHz with a gain of more than 32 dB throughout the operating range. 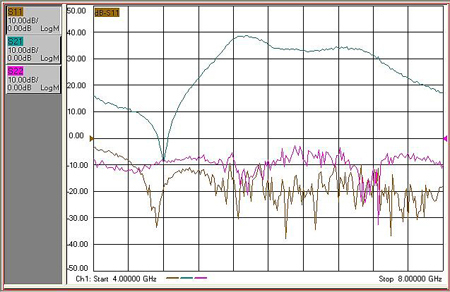 The gain starts falling below 30 dB from 7.1 GHz to 20 dB at 7.7 GHz. 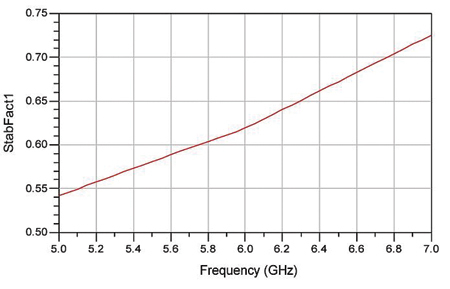 The noise figure varies from 2.4 dB maximum to minimum 1.8 dB in the operating frequency range. The input return loss S11 achieved is 12 dB (typical) and the output return loss S22 is 10 dB (typical). The gain variation over the bandwidth can be improved with less bending of the input matching due to its package size limitation. Variation of device’s manual soldering on the metal piece especially on the source sides affects the gain and noise performance of the device. The noise figure measurement data provided is without the top lid closed. So the measured noise data is more than the simulated data. The fabricated hardware with and without cover lid is shown in Figure 8-9. Figure 6 • Measured gain vs. Frequency response. Figure 7. Measured noise figure vs. Frequency response curve. Figure 8 • Fabricated hardware with cover. Figure 9 • Fabricated hardware without cover. The combination of discrete HEMT based LNA and gain block MMIC takes the advantage of low noise figure of discrete LNA and high gain of MMIC to make a broadband LNA. Also the size is miniaturized by making it as a module which is useful for space application. The circuit has undergone successful hot and cold testing from -30 to +60 ºC. Jayeeta Sinha received her M Tech degree in Radio Physics and Electronics from University of Calcutta in 2006. Thereafter she joined in ISRO Satellite Center (ISAC) and currently working as Sci/Eng ‘SE’. She is working on both linear, nonlinear active circuits and on passive filters in the microwave frequency range. She has authored and co-authored three national and international conference papers. Address: ISRO Satellite Center (ISAC), Old Airport Road, INSAT Building, CMG, Bangalore-560017, INDIA. E-mail: jytsinha@isac.gov.in. Ramasubramanian. R has completed M Tech in Microwave from Delhi University in 1985. Thereafter he joined in ISRO Satellite Center (ISAC) and currently working as Sci/Eng ‘H’. 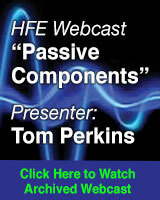 He is specialized on both active and passive microwave circuits. He has in his credit of designing different types of microwave receiver configuration for space Tele command application. He is also a senior member of IEEE and recipient of different awards. Address: ISRO Satellite Center (ISAC), Old Airport Road, INSAT Building, CMG, Bangalore-560017, INDIA. E-mail: subra@isac.gov.in. Y. Wang, Y. Fu, W.-Z. Cui and W. Ma, “A Broadband Low Noise Amplifier Design,” Progress In Electromagnetics Research Symposium, Hangzhou, China, March 24-28, 2008.